In stock -This product will ship today if ordered within the next 10 hours and 44 minutes. 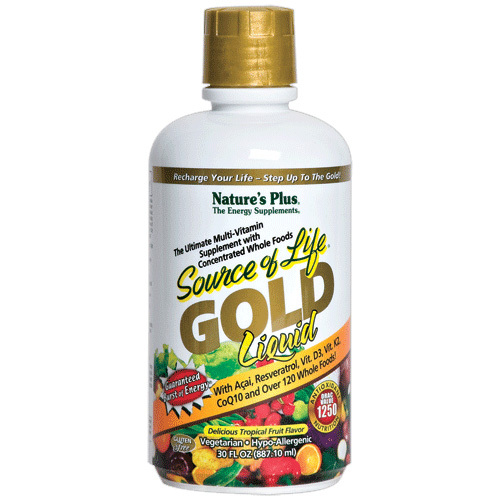 Nature`s Plus Source of Life GOLD is now the gold standard for whole food-based multivitamin supplementation. With revolutionary new all-natural ingredients and more Energising, Antioxidant, and Anti-Ageing power than ever before, Source of Life Gold will change your life with an unparalleled Burst of Life and Burst of Health! With an irresistibly delicious tropical fruit flavour, Source of Life Gold Liquid retains the innovative features, high quality and guaranteed potency of the Source of Life Gold line of supplements. Source of Life GOLD represents the next quantum leap in whole food multivitamin supplementation. Now, Source of Life GOLD builds on all of the natural nutritional technologies embodied in Nature`s Plus` pioneering Source of Life, Source of Life Red and Ultra Source of Life formulas. Source of Life GOLD is the ultimate multi-vitamin supplement with concentrated whole foods! Complete Daily. Vitamin B12 - 1000mcg for exceptional blood support. Vitamin A (as beta carotene and mixed carotenoids from spirulina and Dunaliella salina) - Natural sources of vitamin A, including many carotenoid cofactors for superior activity. Vitamin C (as ascorbic acid; esterified C [ascorbyl palmitate]) - New methods of concentrating the vitamin C in organically grown Indian Amla berry yield naturally occurring Organic Gold Standard vitamin C.
Natural ascorbyl palmitate provides even greater vitamin C activity. Vitamin D3 (as cholecalciferol) - 1000IU of vegetarian vitamin D3 maximizes the bone, immune and overall health benefits. Vitamin K2 - Blood supporting and bone building, natural vitamin K2 in the two most bio available forms as menaquinone-4 (m4) and menaquinone-7 (m7) for unparalleled efficacy. With more than 120 colourful fruits and vegetables Nature`s Plus pioneered the addition of synergistic whole food phytonutrients to vitamin and mineral supplements. Whole food benefits remain a cornerstone of the Source of Life brand. Nowhere is this concept executed with greater abundance and variety than in the Source of LifeGOLD line of products. Source of Life GOLD delivers energizing, health-enhancing phytonutrient benefits from more than 120 whole food concentrates and extracts of the world`s greatest green, red, blue, yellow and white fruits and vegetables. Organically Bound Minerals Each serving of Source of Life Gold provides a specialized array of organically bound minerals for superior absorption, including whole brown rice amino acid chelates. A complete array of all essential and non-essential amino acids, from spirulina, Whole Food PhytoAlgae, chia and mineral aminoates ORAC Value 1250 Oxygen Radical Absorbance Capacity is a measure of anti-oxidant activity. Strength and Endurance White Whole Food Blend - White nectarine, white peach, white fig, date, banana, potato, white pear, white tea, jicama, Jerusalem artichoke, parsnip, turnip, cauliflower, ginger, kohlrabi, shallot, garlic, onion, lemon, oat bran, citrus pectin. Purified water, Vitasweet (fruit juice concentrate, agave nectar, luo han guo [Momordica grosvenorii] fruit extract, citric acid, natural flavors, vegetable glycerin, xanthan gum, Anti-Ageing Blend (alpha-lipoic acid, R-lipoic acid, glutathione, MSM [methylsulfonylmethane], NAC [N-acetyl cysteine], turmeric [standardized curcumin], grape [Vitis vinifera] seed extract [standardized proanthocyanidins]), sodium benzoate (preserves freshness), Trace Mineral Complex (soluble prehistoric plant-based minerals and rare earth elements). Shake Well. As a dietary supplement, take two tablespoons or one capful (about 30 ml) once daily. Tastes great straight from the bottle, or mix it with your favourite beverage. Keep tightly closed, refrigerate after opening and keep out of reach of children. Below are reviews of Source of Life GOLD Liquid - Tropical Fruit - 887ml by bodykind customers. If you have tried this product we'd love to hear what you think so please leave a review. Saw a review on this and decided to try it. It's great for people who are not great with taking tablets and it actually taste nice unlike most multivitamins, I feel a lot more energised in the morning and through the day, if I've had a decent sleep. Definitely would recommend trying! Only thing is the colour of urine is brighter since taking this sorry for the tmi just thought it was good for a heads up. 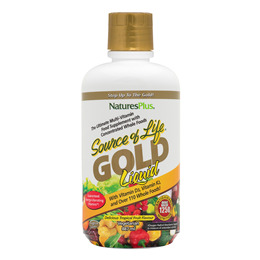 Nature`s Plus Source of Life GOLD is now the gold standard for whole food-based multivitamin supplementation. With revolutionary new all-natural ingredients and more Energising, Antioxidant, and Anti-Ageing power than ever before.